Alcalá de Henares in the Madrid regional community is slated to become the first city in Europe to provide heating to its businesses and citizens from renewable energy generated from a hybrid high temperature solar thermal and biomass facility. 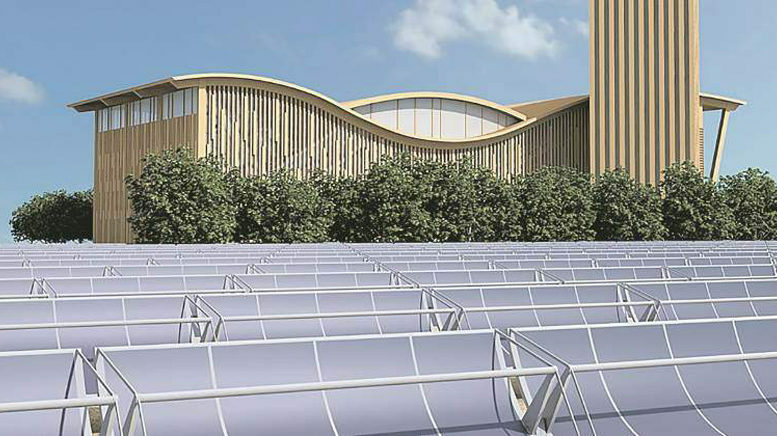 Construction on the hybrid facility of Alcalá District Heating (ADH) is slated to begin next year at a total cost of 40 million over three years and when completed will provide solar-biomass heating to more than 9,000 homes, as well as businesses, schools and universities and government buildings. The project will include the largest distribution network for heating and hot water in Spain, generated from a hybrid 20 MW forest biomass plant and 5 MW high-temperature solar thermal facility to be located three kilometers outside Alcalá. According to ADH’s CEO Teo López, the plant will eventually be able to supply hot water to half the city’s population. Spain’s Ministry of Agriculture has selected the Alcalá project to participate in its program for carbon emissions reduction and will pay ADH for verified CO2 reductions at 9.7 euros per tonne, estimating a total buy-back of about 820,000 euros for 84,057 tonnes of carbon emissions recuction by the year 2022. Energy consumers in Alcalá are expected to save a minimum of 15 percent and as much as 30 percent on their heating bills once the plant is up and running.